Aishwarya Rai Bachchan is snapped with makeup artist, Mickey Contractor while shooting for LifeCell. She is the goodwill ambassador of LifeCell. Neha Dhupia walks for Shane & Falguni Peacock at ABIL Pune Fashion Week. Ranveer Singh & Deepika padukone were seen promoting Ram Leela at Infinity Mall in Mumbai today. 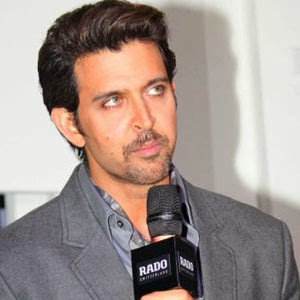 Actor Hrithik Roshan, whose latest release "Krrish 3" has crossed the Rs.200 crore mark at the worldwide box office, does not believe in breaking or setting new records. He feels box office figures reflect the progress of cinema and hopes the "Krrish 3" record is broken by forthcoming films like "Dhoom 3". "Records, these are all facts and figures, which are essential to define the progress of cinema or any other mode of work. So it's not about breaking records, it's about being inspired by the previous records and then taking it forward," Hrithik told reporters Thursday at the launch of the new collection of Rado watches.